The Defending champions of Indian Premier League (IPL), Mumbai Indians, were also able to retain their core. Mumbai Indians (MI) retained their skipper Rohit Sharma, Indian all-rounder Hardik Pandya and Indian pacer Jasprit Bumrah before the auction. After winning the IPL title in 2017, they were looking for the young team at IPL 2018 Auction. At IPL 2018 auction Mumbai Indians used Right-To-Match (RTM) to retain uncapped Krunal Pandya and West Indies all-rounder Kieron Pollard. Krunal Pandya was also the highest bid for MI, which was bought for whopping Rs. 8.80 crores and also the most expensive uncapped player at IPL 2018 Auction. Kieron Pollard was bought for Rs. 5.40 crores. 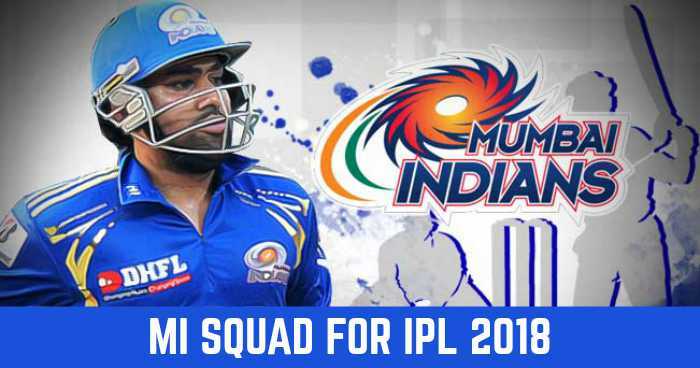 Mumbai Indians don't buy spinner Harbhajan Singh and Sri Lankan fast bowler Lasith Malinga, who were in the team from the opening season 2008. Harbhajan Singh was bought by Chennai Super Kings (CSK) for Rs. 2 crores, while Lasith Malinga remained unsold.